2002 has already become a legendary vintage, producing some of the greatest Champagne of the modern era. Today we are delighted to release the magnificent and very rare Bollinger R.D. The 2002 vintage marks the 50th anniversary of Bollinger R.D, the progeny of Lily Bollinger’s desire to release an older vintage disgorged much later than conventional vintage champagnes. By doing so she created the unique style today which has been copied by every other houses, yet not surpassed – the original oenotheque and still the most revered. Bollinger R.D. is the logical extension of their prestigious Grand Annee, achieved by ageing the wine longer on its lees. R.D stands for recemment degorge or ‘recently disgorged’ in the hard working English tongue: R.D is a registered trademark by Bollinger. Today’s release is the second Bollinger R.D. 2002, the first was disgorged in Autumn 2013, selling out immediately, with the demand dramatically exceeding supply. As such today’s release marks an oenoligical sentiment not a commercial directive. This incarnation was disgorged a year later, adding an extra year’s development on its lees. In 2002 Bollinger R.D. is a blend of 60% Pinot Noir and 40% Chardonnay and of the 23 Crus chosen, 70% are Grand Crus. The 2002 has received 99 points from James Suckling, 96 Points from Antonio Galloni and 95 points from Richard Juhlin. Only the latter has had the privilege of tasting enough vintages to draw a consistent comparison and his scores are illustrated below. 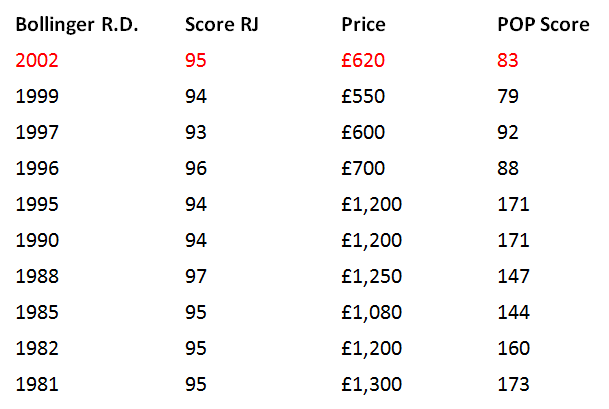 What is clear is that the price of Bollinger R.D. rises steeply after a few years in bottle, with the lower scoring 1995 and 1990 trading at £1,200. As the above table depicts, a Bollinger R.D release is a rarity. However, it is worth noting also that the 1999 vintage was only released in Magnum and Jerobaoms. Moreover the 2000 vintage of R.D was only released in Jeroboam and non was made in 2001. Bollinger R.D. is a Champagne that stands out, even among the very top names due to its rarity and global cachet. It is a truly remarkable wine, one that is hard to source in its youth and very expensive to acquire with bottle age. We are pleased to offer this today in limited quantity, on a purely first come first serve basis. Bollinger’s 2002 R.D. is striking in its beauty. Silky and caressing on the palate, the 2002 impresses for its exceptional balance and harmony. In 2002 so many Champagnes are ripe and explosive in style, but the 2002 R.D. is quite restrained by comparison. Hints of apricot pit, smoke, almonds, spices and pears ring out on the super-finessed, inviting finish. The 2002 is going to be nearly impossible to resist in its youth, but it should also age impeccably. All the elements are in the right place. Dosage is 3-4 grams per liter.